Without much tougher action here in Scotland and around the world we are facing runaway global warming. But we know another world is possible: tackling the root causes of climate change gives us a chance to stop its worst impacts and create a fairer and more equal world. We are facing a climate crisis. People all over the world, including here in Scotland, are starting to feel the deadly effects of climate change. Without a radical transformation of our economies and energy systems we face devastating climate change. This puts our ability to grow enough food at risk, increasing political instability and wiping out tens of thousands of plant and animal species. What’s more, it is usually those who contributed least to the causes of climate change who will suffer most from its impacts. The Scottish Parliament set world leading climate targets in 2009 and since then we’ve made huge strides in developing renewable energy alternatives to dirty fossil fuels. But we now know that climate action planned here in Scotland is not nearly enough to do our fair share of the global fight to halt catastrophic warming. We must do more. In 2019, Scotland will get a new climate law. If we can show that tackling climate change means acting together to build a fairer and more equal society, we can encourage other nations to get on board and create an unstoppable momentum for change. The government’s plans for Scotland’s new climate law fall far short of the action needed to tackle the climate crisis. Help us campaign for urgent climate action. 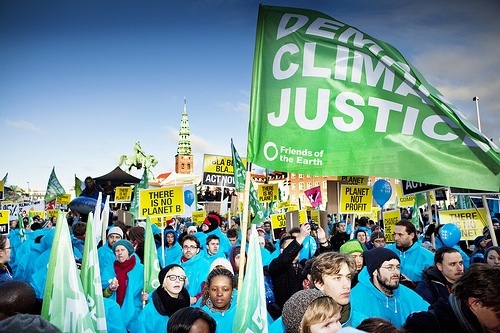 Find out more about international climate action from the Paris Agreement to the IPCC, and how we work with our Friends of the Earth International network and other key allies to fight for climate justice.